If you've never heard of a "Cram Down", you are about to get a first hand lesson on the receiving end of the biggest one in history. The words "Cram Down" used to be reserved for companies in bankruptcy or smaller venture backed companies that run out of cash and are recapitalized by "cramming down" the equity held by existing shareholders. The only other alternative to closing the doors is to reorganize the ownership structure to attract new capital and keep it in business. Those who don't have the money to play in the next round -- i.e. don't have a money printing press -- will get wiped out . Having personally experienced a number of these unpleasant affairs in various businesses, you are definitely better off giving than receiving a Cram Down. Let's say you bought 100 shares of XYZ Company and paid $10 per share. The company runs into trouble and is either going to raise new money or shut down. After a recapitalization or Cram Down, those shares might be worth $.01 per share -- the value of the old shares are set by the new money -- and your investment of $1000 ($10 x 100 shares) would now be worth $1. The new money gets to buy shares for 1/1000th the price you paid for yours, so they invest $1000 of their own money and if you don't, you will own 1/1000th of the percentage in the company that you used to own. These situations are always governed by the Golden Rule, those with the gold make the rules -- the party putting in the new money names the terms. People with a lot of this get to boss around those who don't have a lot of this. You might be able to buy some of the new shares at the new price, but the new money investors usually try to scoop up control of the entity, to enrich themselves even further and prevent future meddling by uppity shareholders, whose old shares are usually converted to "Common" shares -- for this reason, people who get crammed down usually aren't a happy bunch. Common shares are called common for a reason; they don't carry the protections and rights of the preferred shares and common shares fall at the end of the pecking order when a payout happens. Common shareholders are usually lucky to collect a penny when there are lots of preferred shares ahead of them. You're always better to be in the preferred nobility than a commoner in a Cram Down. In bankruptcy, whomever ponies up the "new money" or is favored by the judge receives the lion's share of the equity in the restructured company and everyone else is virtually wiped out or "crammed down". In a bankruptcy, the judge has wide latitude to "cram down" various classes of debt and equity and involuntarily impose this over the objections of various classes. A recent example is the General Motors bankruptcy, where the bondholders were crammed down for the benefit of the unions, which went against 200 years of established bankruptcy law (normally the company's lenders get the majority of the equity, unions get a much more modest share for concessions). The golden rule applied here, too. The U.S. government put up the gold and ruled that the United Auto Workers should get the equity, not the widow and orphan GM bondholders. The bondholders investment of $27 billion of their cash wasn't worth as much in that Cram Down as the future votes of the United Auto Workers, who put in no cash and offered a modest discount to their company busting union contract. GM filed for bankruptcy protection June 1, 2009. Bondholders got 10% for their $27 billion, the U.S. government got 50% for their $50 billion invested and the United Auto Workers union got 40% for political connections. Elderly retirees lost a large part of their retirement savings in this Cram Down. Governments, companies and individuals around the world all have a mountain of debt they will never be able to repay; they are INSOLVENT. In the old days -- debt would be extinguished by repayment in gold or the loan would default and the lender would take over the collateral. What's special about gold? For 5,000 years, gold has been considered money without counter-party -- it's just you and a lump of gold -- you are not reliant on the good credit of another party. It's where the buck stopped, literally. 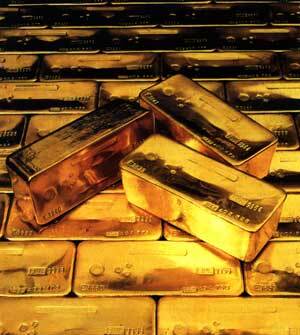 Today, in the era of unlimited money printing, there is no gold repayment. We replaced gold repayment with money printing by the privately owned central banks. When a central bank issues money in excess, existing holders of that currency are "crammed down" by the new money coming into the system. Since 1913 when the Federal Reserve was created, over 95% of the value of a dollar has been crammed out of the pockets of savers and into the hands of bankers, politicians and the recipients of the new money. This slow motion Cram Down is called Inflation and it is the mortal enemy of the saver. As you are about to see, the motion is about to get a lot faster because there is a new, efficient tool being used to strip value away from savers known as the Bailout. The first dollar Cram Down took about 100 years to strip 95% of the value from savers. The next 95% devaluation will take just a handful of years. 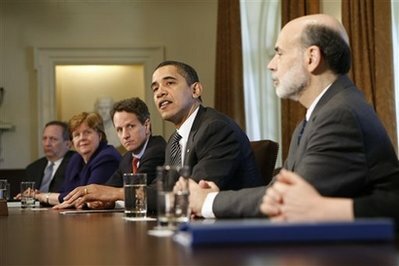 A number of commentators have estimated we are already into the bailouts to the tune of at least $14 trillion. This is in addition to last week's report in the UK Telegraph (covered in my column HERE) that a well connected banker estimated the next round of "Quantitative Easing" (or QE2 as they now call this round of bailouts) could reach $30 trillion, or about 50% of the world's GDP. Given that this money is, like all fiat currency, issued in the form of debt, how would that extra $30 trillion ever be paid back? When money is issued as debt, there is no end to the need for money to pay the interest on the existing debt (e.g. : if $100 is issued at 5% interest, another $5 of money must be created just to pay the interest, but there is interest on the interest, ad infinitum). As we explored last week, we're now beyond the point of ever paying back the CURRENT debt with anything resembling the value it had upon issuance. Once you can't pay the interest on a debt, much less any principal, it's game over. The markets will eventually force the hands of the politicians and raise the interest rates, it's only a matter of time. But the Federal Reserve will use the money printing press for all it's worth, something Greece didn't have at its disposal because they had switched to the Euro, a currency they couldn't print themselves. That will only delay the outcome, which is not in doubt - the issuance of new money is a nearly perfect analog for the issuance of new shares by a distressed company. The Three Money Printers (from right Ben Bernanke, Federal Reserve chairman, President Barack Obama, Treasury Secretary Timothy Geithner). Last week, I did a thought experiment to see If the government and Federal Reserve could protect savers and other hard working citizens by issuing money to pay for a wind down of the welfare state (FDIC saver guarantees, Medicare, Social Security, etc) -- it would be a bailout of about $30 trillion, but that would be the end of it -- debt would be wiped out because all the new money would be issued directly from the government with zero interest payable. The unsustainable welfare state would be dismantled in an orderly fashion. As we discussed, the chances of that happening right now are zero, because the elimination of the welfare state is not in the best interests of the politicians, bankers or the rapidly growing number of those dependent on the system. It's not a pretty sight for people of any political persuasion to watch human suffering of this scale, but it might offer less suffering than that caused by the complete destruction of the currency. States - Meredith Whitney released a new 600 page report detailing this next $ trillion bailout. States, like everyone else need to remember that there is a price to everything and no free rides, but they really, really, really need the money. Pensions - States alone could have a $3 trillion shortfall. Union and corporate pensions have hundreds of billions more they are trying to stick with the taxpayer via the Pension Benefit Guarantee Corp.
FDIC - According to problembanklist.com, the FDIC insures deposits at 7,932 banks with total assets of $13.2 trillion but now the FDIC has a negative reserve ratio, meaning they will also need a bailout in the future, as more banks continue to fail. There are over 800 banks on the "problem bank list"
Financial Regulatory Reform Bill - Creates permanent bailouts of even more banks - bondholders and banks could need $10-14 trillion. Nuclear power - Now "dead" with the climate bill in the U.S. congress, you can expect this group to arrive on Capitol Hill with their hands out in the future. Everyone wants to get in on the bailout action. All the Green energy people will be right behind them. Foreign banks - The IMF and large foreign banks will no doubt be the beneficiaries of largesse. They received billions from the AIG bailout. Federal Budget Deficits - $2 trillion per year and counting. Social Security and Medicare - With $107 trillion in unfunded future liabilities, Social Security now takes in less in taxes than it spends. Naked Credit Default Swaps - credit default swaps are insurance on bonds against the possibility of default. If AIG could get a bailout, this $36 trillion market (at the end of 2009) would make the AIG bailout look like pocket change. At some point, there will be a failure and these will be Too Big to Bailout (TBTB). Could the U.S. "print" the $100 trillion to bail this out? Sure, it's just another few zeros in a computer, but at that point virtual money has no value. Even paper money will have more value than electronic foo-foo dollars. Another scenario that could bring this to a head rapidly is a currency crisis involving the euro or U.S. dollar, a run on the credit default swaps, a major bank failure or some other calamity that involves lots of bad decisions which are about to leave a private company's balance sheet and become the public's problem. Because everything in the financial world is now interconnected via complex hedging, contractual relationships and derivatives, when one bank fails, it could take out another 10, 20, 100 banks and even jeopardize the entire financial system. There have been a number of near misses, such as Long Term Capital, the crisis of 2008 and so on. The fiat money solution has always been to PUMP. When the world ran on a gold standard, those who over-leveraged and couldn't pay back their debts on demand are wiped out in the blink of an eye. That used to be called "a run on the bank", when the depositors (creditors under the law) of a bank demanded repayment of their deposits and the bank didn't have enough money to satisfy these demands. The bank president's personal possessions would be sold on their front lawn to satisfy the creditors. Those who were prudent and saved for a rainy day got to pick over the carcasses of the bankrupt for pennies on the dollar. There is something to be said for this kind of economic justice. However, the rules of engagement have changed in today's amoral climate. In today's universe of fiat currency, the central bankers just "print" more money, lend it out to the banks in need and avert the liquidity crisis, at least temporarily. That was the original purpose of the Federal Reserve and some argue it's worked pretty well up till now (others beg to differ). Ultimately, this lands at the feet of We The People in the form of a currency crisis. So much money will need to be issued to maintain the system that the currency diminishes in value very quickly. Those who saved and played by the rules are the "current shareholders" who will become destitute. The new money will own the whole joint. This is in fact a Cram Down. Because a Cram Down changes the ownership structure of a company, this one will change the ownership of the U.S. Never underestimate the politicians and bankers taking the easy way out. Printing money and kicking a bigger can down the road is always easier than facing the reality of your debts. The executive branch of the U.S. Government, the Treasury Department and the Federal Reserve Bank will be directing the Cram Down action and they will all be trading for their accounts. It's not hard to imagine what the rest of this Cram Down will look like in the hands of the Obama administration. If you were a GM bondholder, you already know how this will go. Like any Cram Down, you won't want to put a penny of your own money in the next round until the entire management team has been fired. They were the people who put the car in the ditch and you have to take away the keys. Let's see who gets fired in the next election. One other bit of advice worth sharing; an elderly man on the Mexico City subway kindly pointed out a gang of pickpockets entering the car and said: "Watch Your Pockets! ".